The Arroyo Course, Red Rock Country Club's Arnold Palmer Signature course is open to public play and is located in the Master Planned Community of Summerlin in Las Vegas. The Arroyo golf course ribbons seamlessly through the rugged terrain and is nestled between the spectacular landscapes of Red Rock Canyon, one of Las Vegas' most revered natural landmarks. Panoramic views of the Las Vegas cityscape are stunning from the Arroyos hole #7. Stretching 6,883 yards and playing to a par 72, the Arroyo is a rare mix of compelling design and exceptional beauty. Bold bunkering, dramatic water hazards and the stark contrast of emerald greens against the tanned desert mountain, make the Arroyo as visually striking as it is challenging. A long meandering par 5, Arroyos first hole requires three well-executed shots to safely reach the green. Off the tee, you must successfully negotiate two fairway bunkers to get it in the fairway. Your second shot plays downhill to a wide landing area approximately 140 yards from the green. The large green is guarded on three sides (front, back and left) by three deep bunkers. Arroyos second hole is a strong par 4 that plays slightly uphill. A small lake has been placed to the front and left of the tee boxes, but is not really in play. Three fairway bunkers guard the tee shot landing area, therefore, placing a premium on accuracy off the tee. A long to mid-iron is required for your second shot to the green which is protected on three sides by four sand bunkers. Proper club selection is key on this par 3 as prevailing westerly winds often aid tee shots to the green, which sits slightly downhill of the tee box. Seriously, depending on wind speed and direction, this testy par 3 can play anywhere from a wedge to a 2-iron. In a classic old-world architecture move, Palmer deceives the eye as greenside bunkers appear from the tee to engulf the green. Upon closer inspection, golfers will be pleased to know theres plenty of room to land the ball on the green. This long par 4 snakes its way toward beautiful Red Rock Canyon. In addition to a challenging golf hole, this tough par 4 also provides golfers with dramatic views of the canyon ahead and the Las Vegas cityscape afar. The real test on this hole, however, comes in the accuracy of your shot into the green often with a long-iron. Two large bunkers front the green and must be safely carried in order to have a chance at birdie. 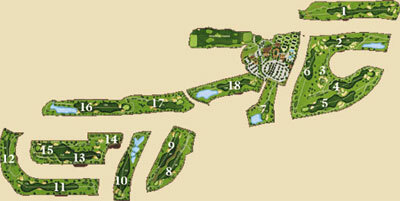 A great par 5 that can be reached in two with two well-struck shots, Arroyos fifth hole is a true risk/reward golf hole. Go for it in two and risk getting buried in the bunker that sits 20-yards short of the green in the middle of the fairway. Carry that pesky bunker, and youre rewarded with an eagle try. This challenging par 4 plays 413 yards slightly uphill and into the westerly wind. An expansive, bunker less fairway greets golfers off the tee. Proper club selection and distance control are key on shots into the green because the green is much wider than it is deep. Sand bunkers left and right of the green frame this hole and make it a visually striking hole. Definitely one of the more exciting and fun-to-play holes at Arroyo, this 215 yard par 3 plays downhill to a green perched on the edge of a beautiful lake. Tee boxes sit approximately 100 feet above the large kidney-bean-shaped green which is guarded short right and left by large bunkers. To call this hole a dogleg right would be stretching the truth a bit. However, if you favor the right side of the fairway off the tee, you can shorten your approach shot into the green. Beware of the bunker that guards the left side of the green. This short par 4 plays slightly uphill. Take a good smack at it and make it over the fairway bunker (about 220 out) on the left side of the fairway. Do that and youre left with a soft wedge into a receptive green. The first of three holes on the backside that requires a carry over water off the tee, this 400-plus yard par 4 also plays slightly downhill. Fortunately, the fairway is wide and relatively hazard free. A large green, sloping from back to front, is very receptive to long-iron shots. This short par 5 has birdie written all over it. Trouble of the tee is minimal as the fairway gently rolls out ahead of you. Three strategically placed bunkers lurk around the second shot landing area making accuracy a key. The long narrow green is open in front which means it will accept roll up shots. This long par 3 is considered one of the toughest holes at Red Rock. While, there are no water or sand hazards to get lost in, the lethal combination of length and a prevailing headwind make number 12 a stiff challenge. Length off the tee is important on this par 4. Thankfully, the landing area is generous. The huge green gently slopes from back to front and easily accepts a long second shot. Bunkers guard the green front right and long back. The large green on this par 3 makes for an easy target. Just make sure you avoid the large pot bunkers in front right and long left. Also, be mindful of the pin position. The tiered-green can make putting a challenge. The longer you hit it, the more trouble the fairway bunkers will be. Instead, use a long-iron off the tee to avoid the danger and hit a soft wedge into the shallow green. Just make sure your second shot carries that treacherous fairway bunker in front of the green. After 15 holes your driver should be warmed up enough to launch one at least 230 yards over a lake thats the challenge awaiting you off the tee on this 533 yard par 5. If the water hazard wasnt enough to contend with, the fairway also narrows and is bordered by two fairway bunkers near the driver landing area. Negotiate all of that, then turn your attention towards the huge green and take dead aim at it. Long is better than short when approaching this green as two massive bunkers guard the greens front edge. Choose a three-wood off the tee for better control and aim for the right side of the fairway. Approach shots from the right side of the fairway will take the bunker complex on the left side of the green out-of-play. Arnold Palmer wouldnt be The King without a career chalked full of late round heroics. Same could be said about the Kings courses hell always give you a heroic finishing hole in which birdies can be snared. This 401 yard par 4 is no exception. Carry the lake off the tee and position yourself in the throat of the fairway that narrows to just 20 yards. With a mid- or low-iron in hand you can attack the pin and go for broke. Beware of the bunkers that guard the left side of the green. ADDRESS 2250C Red Springs Dr.